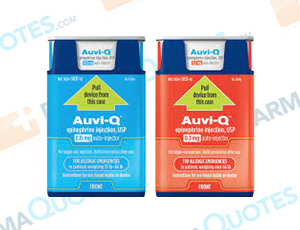 Auvi-Q is a prefilled needle system used to administer epinephrine to treat very serious allergic reactions. Auvi-Q may be necessary for insect stings and bites, foods, drugs, or other substances when a person has an allergy. Epinephrine is effective at improving breathing, stimulating the heart, raising a dropping blood pressure, reversing hives, and reducing swelling of the face, lips, and throat.This and other drugs should be used under the direction of a doctor with a complete and current list of medications and medical history, including allergies. This product is a life-saving product and should be used as prescribed despite known risks. Patients should talk to their doctor before taking this medication if they have a personal medical history of heart conditions, high blood pressure, thyroid disease, diabetes. This drug may cause dizziness. Do not drive or operate heavy machinery until you know how Auvi-Q will affect you. Patients may also experience a fast or pounding heartbeat, nervousness, sweating, nausea, vomiting, headache, anxiety, difficulty breathing, tremors, and pale skin. Auvi-Q should be used if necessary, but discarded if not used before it expires. Check your device regularly for discoloration of medication. Call your doctor right away if your device is expired or if the medication has visible particles or color changes. Read all information from manufacturer and pharmacy. It’s important to follow manufacturer, pharmacy, and doctor’s instructions when using this and other medical products. General Auvi-Q Warning: The above information is for informational purposes only and is not meant to be a substitute for professional medical advice, diagnosis or treatment. Please seek professional medical advice before starting, changing or terminating any medical treatment. Pharmaquotes is not offering medical advice, pharmaceutical recommendations or endorsing any specific prescription drug, pharmacy or other information on the site. Pharmaquotes provides no warranty or guarantee for any of the discount data, medication, or other information.